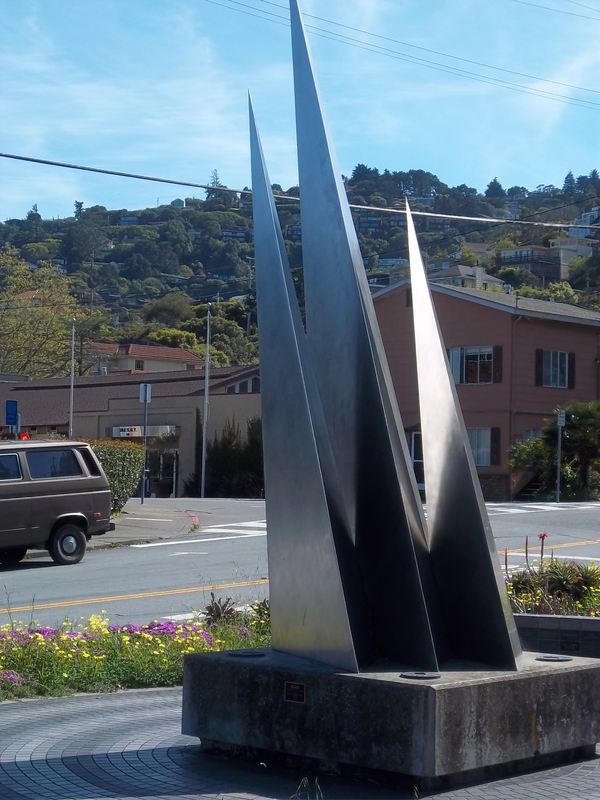 OUTDOOR ART OF SAUSALITO | Carol Sheldon writes books exploring times-past through mystery, love, betrayal and murder. I’d like you to see some of the works of art in my town—some present, some hidden and some recently destroyed. 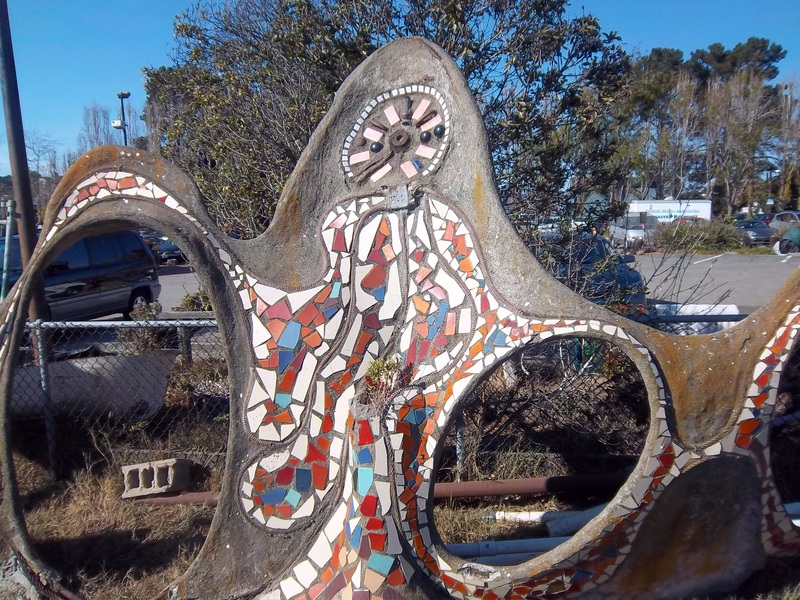 Last year it was sad to me that a beautiful serpentine sculpture embedded with colored tiles was hidden among weeds and parked cars when I first saw itI was hoping that it would be moved to a public park where it could be seen and appreciated by many. I’m sorry I didn’t speak up. Recently, this property, (near Gate 6, if you’re familiar with our town,) was re-purposed. The lovely sculpture, about 12 feet long, was broken up and plowed underground, as the land was flattened. I understand it’s to be fashioned into a park. What irony! Local mermaid, hidden behind a Shell sign. 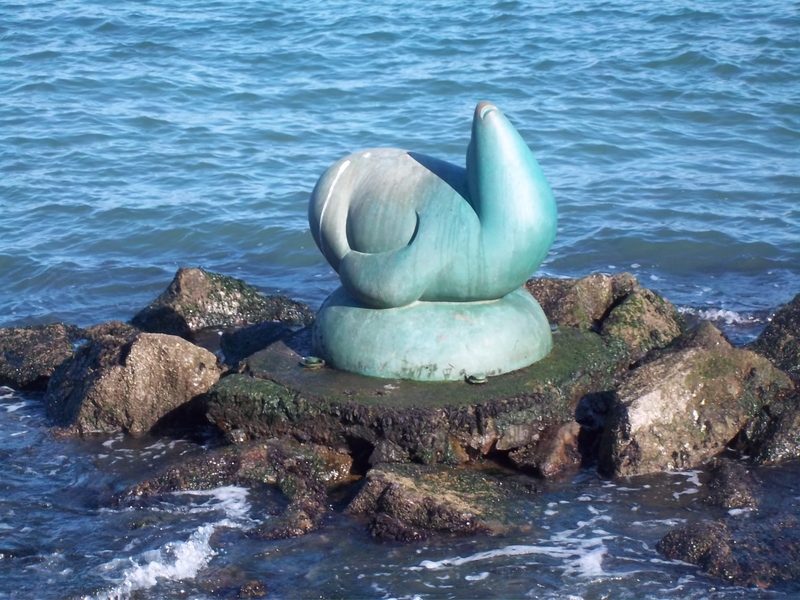 The lovely sculpture of a mermaid is virtually hidden behind a Shell gas station on Bridgeway, with a sign that states it is looking for a home. The powers that be noted some years ago that mermaids don’t wear bras, and therefore decreed it was not fit to be displayed in any of our parks. What happened to individual expression, imagination, creativity, and the ingenuity of the artist? Sadly, this sculpture remains in view of few, while little artwork adorns our parks. The famous seal is visible, but not if you’re driving. To see it, you must be walking on the water side of Bridgeway, shortly before it ends on the street turns abruptly inland. There it is, a lovely work, adorning the shore of our city. Perhaps the most visible piece of outdoor art is the set of abstract sails on the junction of Bridgeway and Caledonia. Even this has been missed by some local residents! I’m glad that I’ve been able to observe these works of art. I share the images—past and present with you– before, (perhaps,) more disappear from our horizon. We have a lovely city. It is usually a challenge to slalom one’s way down Bridgeway through the many bicyclists on the road , and the tourists who are so many that they overflow the sidewalk onto the street. But this just testifies to the charm of Sausalito. This entry was posted in mystery, Sausalito. Bookmark the permalink. 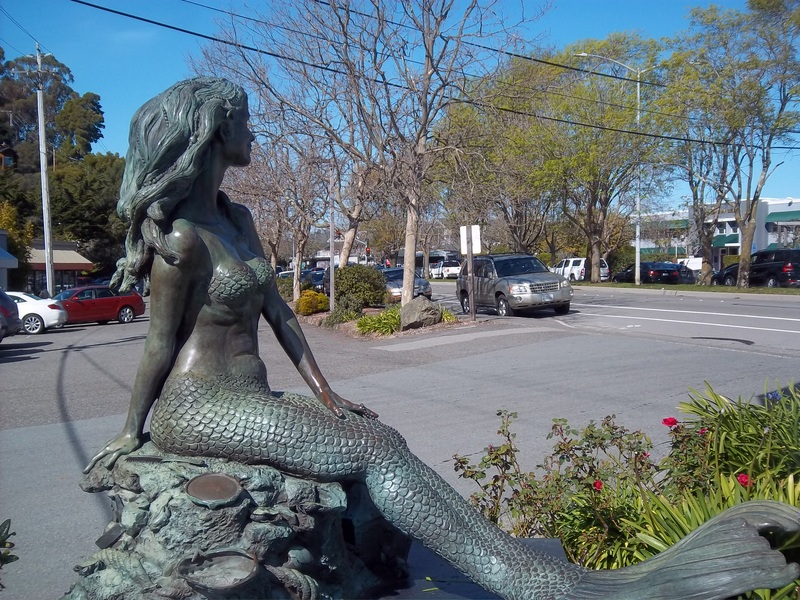 I googled “Who sculpted the Sausalito mermmaid?” and found a very informative article. You can do the same. I’ll find out who the artist is and put you in contact with her.